I came across this recipe in Cook’s Illustrated Magazine, November 1, 2001, and was fascinated with the flambé part. So I did my research on how to flambé and proceeded with caution to gain a new experience. This Sea Scallops Fra Diavolo with Linguine is a colorful dish, very elegant and tasty. One change I made was to use garden fresh tomatoes that I had dried slightly in the oven rather than the canned tomatoes they suggested in the original recipe. Following is my adaptation of the recipe. Fra Diavolo literally translated from Italian to English to mean “brother devil” or “brother of the devil.” In the language of food, means extra spicy hot! The name is generally give to a spicy sauce for seafood or pasta used in American Italian cooking. This recipe, comments, and photo were shared with me by Karen Calanchini, Food Stylist and Photographer, of Redding, CA. * Most purchased scallops are wet-packed and have been soaked in a liquid solution that keeps them looking white. To remove this solution, rinse the scallops thoroughly and then pat them dry with paper towels. If you can find "dry-packed" scallops (which have not been soaked), you don't need to rinse them. Scallops have an adductor muscle (sometimes called a "foot") on it's side. It is a tough little tab of meat that you should cut off before cooking the scallop because it can be kind of chewy. 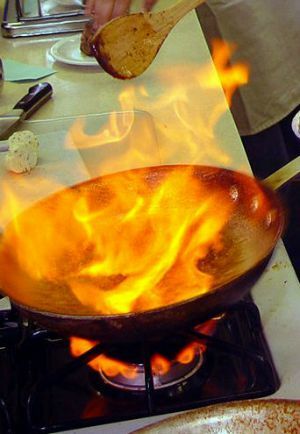 ** Use an 80-proof liquor/liqueur or 40% alcohol by volume for flambng. *** Learn how to make Slow-Roasted or Baked Tomatoes. Cook pasta according to package directions; drain, reserving 1/2 cup of the pasta water. Learn How To Cook Pasta Properly. In a large bowl or re-sealable plastic bag, toss the scallops with 2 tablespoons olive oil, 3/4 teaspoon salt, and 1/2 teaspoon red pepper flakes. Have all your equipment and ingredients needed to flambé your dish ready before starting the process. In a large skillet (use a flambe pan, large skillet, or large chafing dish with rounded, deep sides and a long handle) over high heat, add the scallops in a single layer, and cook, without stirring, until bottoms of scallops turn golden, approximately 30 seconds; remove from heat. At this point, turn off your exhaust fan, roll up long sleeves (if wearing), and tie back long hair. Off heat, turn scallops over, add brandy or cognac, and let pan warm approximately 5 seconds. Wave a long lit match over the pan until the brandy ignites, and then shake pan to distribute flames. When flames subside (at this point all alcohol has burned off), transfer the scallops to a bowl and set aside. The scallops are perfectly cooked when an instant-read cooking or meat thermometer inserted into their centers reach 115 degrees F. The carryover cooking will add another 10 to 15 degrees, for an ideal final temperature of 125 to 130 degrees F. They should also have lost their translucence and turn opaque. Let the skillet cool slightly, about 3 minutes. Add 3 tablespoons olive oil and 3/4 of minced garlic into the frying pan. Cook approximately 10 minutes, stirring occasionally, until the garlic foams, and becomes sticky and straw colored. Stir in the roasted or canned tomatoes, white wine, 3/4 teaspoon salt, sugar, and remaining 1/2 teaspoon red pepper flakes. Increase the heat to medium-high and simmer until thickened, approximately 8 minutes. Stir in the cooked scallops (along with any accumulated juices), parsley, and remaining garlic into the sauce. Let simmer until the scallops have heated through, approximately 1 minute. Remove from heat. Off the heat, stir in the remaining 1 tablespoon olive oil. Add 1/2 cup sauce (without the scallops) to the linguine and toss to combine. Add reserved pasta water as needed to adjust consistency. Serve immediately, topping individual bowls with scallops and more sauce. Sprinkle additional parsley over the top, if desired.